Nothing ever happens in High Wycombe. Bryony Buckle spends her days living alone with her cat Elton, working a monotonous office job with her friend Poppy, and crushing on her colleague Orson. But one day, the combination of a hormone injection from her doctor, and being struck by lightning on her way home, results in Bryony waking up with superpowers! She decides to use them for good: Wherever men are arseholes, Vulvarine is there to stop them. But it isn’t long before she’s challenged by an evil scientist: The Mansplainer. Can Vulvarine and her friends defeat him? Fat Rascal Theatre continue to set the bar for off-West End musicals. I was lucky enough to catch their Beauty and the Beast: A Musical Parody back in November at The King’s Head, and arrived at VAULT Festival last night with impossibly high expectations. Their Beauty and the Beast was the most fun I’d had at a show in ages; it was a question whether they’d be able to match their own standard. But without doubt, Fat Rascal have done it again. Vulvarine is a triumph of musical theatre. 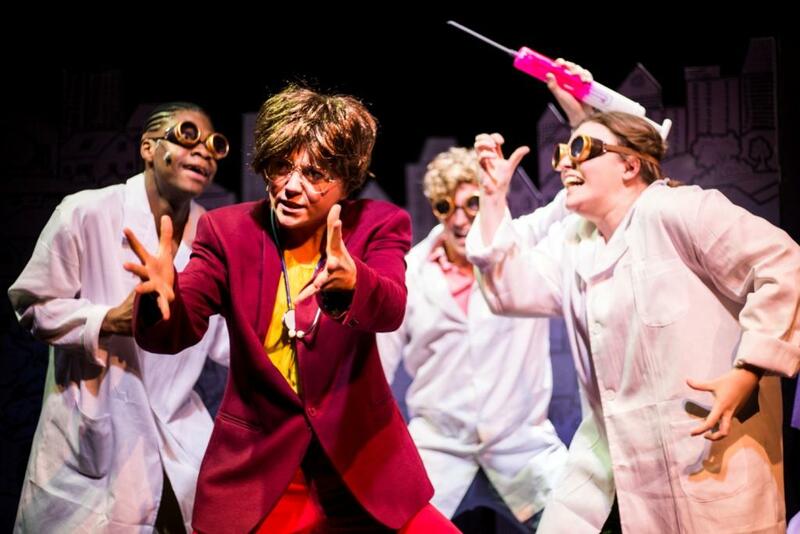 A powerhouse of a show, Vulvarine is an astoundingly clever and absolutely hilarious musical parody of the superhero genre. It’s also feminism at its silliest and most entertaining. West-End voices belt out smart, witty lyrics (Robyn Grant, Daniel Elliot) to fun, highly accomplished music (James Ringer-Beck). The performers are superb. Their comedy is faultless, their parody expert. Self-aware humour is one of Fat Rascal’s own superpowers. With a somewhat lower budget than the typical Marvel film, they create a brilliantly funny aesthetic with cheap wigs, comically fast costume changes, flimsy props, and total mockery of ‘effects’ (a handheld vacuum in reverse is the wind as Vulvarine ‘flies through the air’). The show is laugh-out-loud from start to finish. The audience really almost never stops laughing. There ought to be a warning for anyone prone to hysterical fits; some people lost it completely. Allie Munro is equally lovable and fierce as Bryony/Vulvarine. Jamie Mawson is delightful as the ‘pretty’ love interest, Orson (a nice gender swap from typical Marvel plotlines). Steffan Rizzi is great as Sonya, and sings a particularly powerful solo – “Boys Will Be Boys” – which is done with surprising heart and skill. Robyn Grant and Katie Wells slay their multi-rolling performances. All of the voices in this show belong on much larger stages. It’s a rare treat to find musical comedies on the fringe circuit that are as technically good as they are funny. Fat Rascal Theatre are at the top of their game. An undeniable hit, Vulvarine is the latest addition to their list of victories. The show is shamelessly silly fun, created by powerfully talented people. You’ll be hard-pressed to spend a more enjoyable hour and fifteen minutes in a theatre. Beauty and The Beast at the King’s Head Theatre stands as a testament that when theatre is funny, rehearsed and joyous not much else matters. 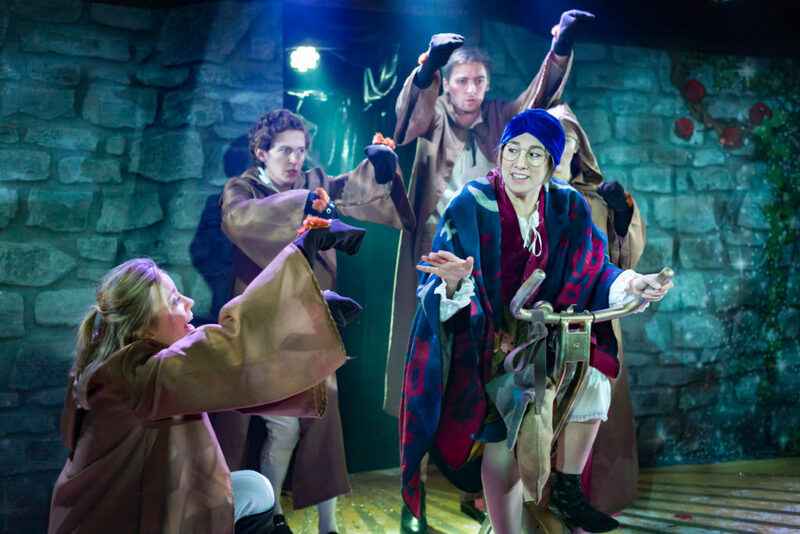 Robyn Grant (writer and The Beast) and Daniel Elliot (writer) leave one the most generous pub theatres in London feeling selfish as the show bursts at the seams with energy, comedy and wit. Beauty and The Beast is billed as a trendy gender-swapped version of the classic fairy tale but immediately it throws off these constraints and shows itself as a brilliant musical satire of the Islington set with some unmatched comic performances. At the centre of the show is a knowing, contemporary book and lyrics from Grant and Elliot and obviously supplemented by devising work from the whole cast. Jamie Mawson (Beau) plays the male Belle as a bourgeois North London son of a painter woman; foppish, innocent and vulnerable as he and his mother (played by the brilliant Allie Munro) are the perfect send-ups of the artist class. These performances paired with songs like “Have a Brunch” instead of “Be our Guest” are an insightful and playful tease of many in the audience, without being cruel. The set, costume and props sit where they are supposed to, in service of the production. Puppetry, costume and lighting help tell the story as they speak but don’t shout. While not a high-value production, the team made the effort where it counts and the beast’s costume added bucketsful to Robyn Grant’s performance. With strong and stable music and roundly good singing, the production stepped deftly over the pitfalls littered for smaller musicals. Our audience was in good hands with these young actors performing both technically and artistically. Without the pressure of musically complex songs, singers were able to relax and focus on the comedy and physicality of the songs. At this late stage, it would be wrong not mention the stand out performances of Allie Munro (Le Fou Fou/Lumie/Maureen) and Katie Wells (Siobhan/Clockface) throughout. Despite not being in leading roles both gave generously from centre and side stage with performances that leave you sure you will see them again. Overall, this show gave so much and yet we could feel that somehow it still had potential to grow. There will be much more to come from this show and there is no doubt that we will see it again, and likely in some grander setting. It’s easy to get theoretical about fairy tales with genders swapped but when it comes to great musical theatre it’s better to say “I’ll know it when I see it” and with Beauty and The Beast you’re looking at it.